Wilson Estate Online Auction — Harritt Group, Inc. 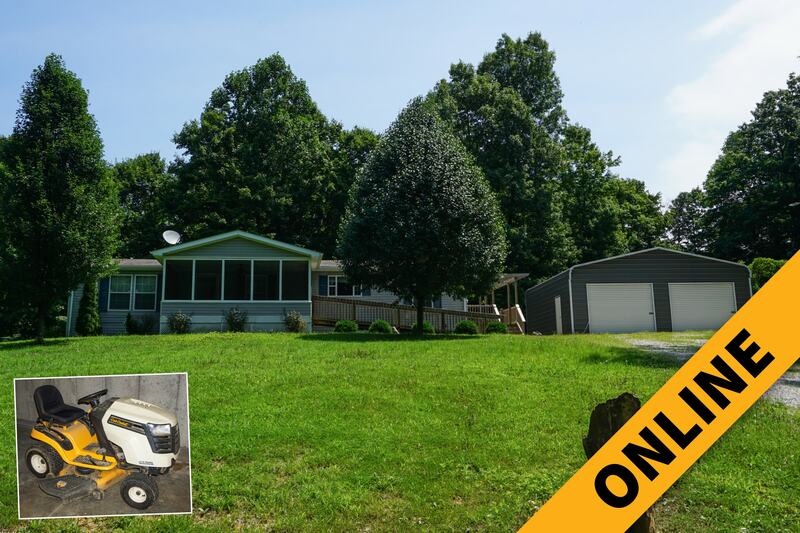 Selling online to settle the Logan Wilson Estate a private 11.75 acre tract of land in Harrison County with a 1792 square foot pre-manufactured home with screened porch, fireplace, full basement and a detached 2-car garage just 2 1/2 miles off Hwy. 111 near Rosewood. Property on one side is bordered by The Nature Conservancy and the other side by Taylor Township of Harrison County, Indiana. Also selling personal property including a Cub Cadet riding mower, furniture and more. Wooded 11.75 acre tract of land with improvements include a 2004 double wide pre-manufactured 3 bedroom – 2 bath home with full walkout basement, 11’6 x 18’ screened porch, 10’ x 23’ wood deck with pergola, old shed plus detached 28’ x 30’ metal garage. Home features generator, electric heat & air, vaulted ceilings, wood burning fireplace in family room, eat-in equipped kitchen, master bath has a separate shower and garden tub, a skylight and a walk-in closet, 2 additional bedrooms in a separate wing, a full bath plus equipped laundry mud room off deck. An additional 1792 square feet unfinished in the full walkout basement with poured concrete walls and double utility doors to private backyard. Water — Elizabeth Water Corp.
Cub Cadet LTX 1045 hydrostatic riding lawn mower with 46″ cut and 20HP Kohler single-cylinder hydrostatic automatic OHV engine 95 hours. Oak 4-piece bedroom suite including bed, dresser, armoire & nightstand, cherry finish 3-section entertainment center, oversized sofa & loveseat, wingback chairs, 3-piece coffee end table set, oval dining table & chairs, small roll top desk, full size bed, chest of drawers, lamps, computer desk, roll office chairs, Frigidaire chest deep freeze. From New Albany take West Main Street to St. Rd. 111 (River Road). South 18 miles to right on Rosewood Road. 2 miles to left on Rabbit Hash Road. 1/2 mile to property on left. From Edwardsville take St. Rd. 62 to St. Rd. 11. South 13.5 miles thru Elizabeth to left on Rosewood Road. 2.8 miles to right on Rabbit Hash Road. 1/2 mile to property on left.